Tell Santa you’re being nice this year because you are absolutely having only “An Honest Christmas Party”! Well, more specifically, you will be attending the honestly awesome party pop punk band An Honest Mistake will be throwing for everyone this December. Of course, the band will be rocking the crowd with nearly 20 of their songs, including new singles and unreleased materials, but they’re not the only performers of the evening. Singers Kareema Ramli, Maruxa Lynd, Amanda Love and Aisyah Aziz will also take the stage to croon some Christmas tunes. Airwaves on Fire, Battle Bloom, SOAP, Nadhira will be belting out some notes too before DJ Cuurley and hip hop star Kayda wrap up the party with their tracks. Wait, the fun’s not done! Head on over to Ren @ Kyo KL for the after party that’s held in conjunction with Fruit Machine’s Emo Night. 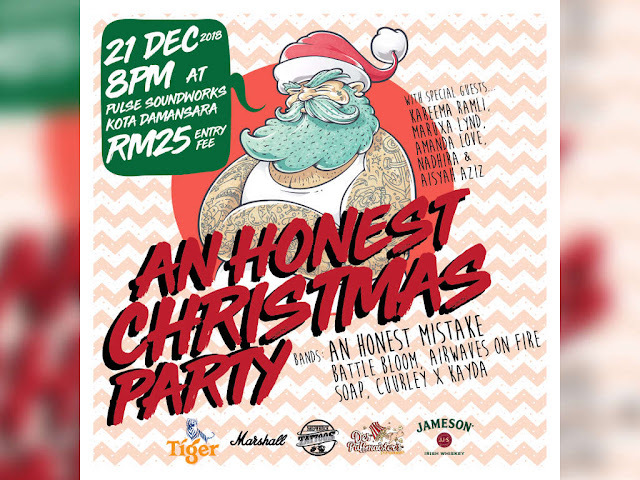 Just show off your “An Honest Christmas Party” stamp and you’ll get to party on till 5am. For just RM25, you’ll get to munch on Des Puffmaister’s Popcorn and receive gifts from Marshall Headphones/ Ash Asia Malaysia, tattoo crew Shipwreck Tattoos, beverage partners Tiger Beer and Jameson Irish Whiskey. Note that drinks and merchandise on sale will be limited so hurry hurry and don’t be too fashionably late to the party! tubemate app download: It is a YouTube downloader app. This app is user-friendly.